Stephen Andrew Gill Hough, CBE (born 22 November 1961) is a British-born classical pianist, composer and writer. He became an Australian citizen in 2005 and thus has dual nationality. He was born in Heswall (then in Cheshire) on the Wirral Peninsula, and grew up in Thelwall, where he began piano lessons at the age of five. His father, who was born in Australia, worked as a technical representative for British Steel before his death at the age of 54. At a young age, Hough was able to memorise about 100 nursery rhymes and, after much pleading, his parents agreed to buy a second-hand piano, for £5 from a local antique shop, for the home. At the age of 12 he suffered what he has described as a “mini-nervous breakdown”, triggered by a mugging incident, which resulted in him taking almost a year off school. He studied at Chetham’s School of Music, which he later described as “not a wonderful place”, and at the Royal Northern College of Music. In 1978, he was a finalist in the BBC Young Musician of the Year Competition and won the piano section. In 1982, he won the Terence Judd Award in England. In 1983, he took first prize at the Naumburg International Piano Competition in New York City. Hough holds a master’s degree from the Juilliard School where his studies were assisted by the receipt of the first ever Royal Philharmonic Society Julius Isserlis Scholarship for study abroad. He has studied with Heather Slade-Lipkin, Gordon Green, and Derrick Wyndham. He is also a composer and transcriber, and often includes his own works in his recitals. He has written over 30 published pieces. The premiere of his cello concerto, written for Steven Isserlis, took place in March 2007, and in the summer of the same year Westminster Abbey and Westminster Cathedral performed masses he wrote for them. In 2009, his trio for piccolo, contrabassoon and piano (‘Was mit den Traenen Geschieht’) was premiered at the Philharmonie in Berlin by members of the Berlin Philharmonic. His song cycles ‘Herbstleider’ (2007) and ‘Other Love Songs’ (2010) were premiered and recorded by members of The Prince Consort. His ‘Sonata for Piano (broken branches)’ was premiered by himself at the Wigmore Hall in 2011. In 2012 the Indianapolis Symphony Orchestra and Symphonic Choir gave the world premiere of the orchestrated version of his Missa Mirabilis. 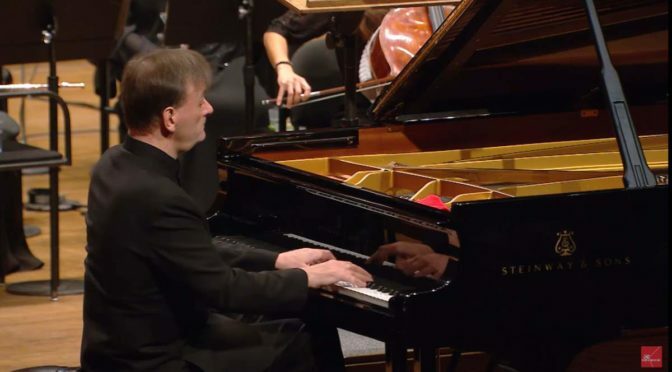 He is an Honorary Member of the Royal Academy of Music in London, where he is a visiting Professor, and a Fellow of the Royal Northern College of Music in Manchester, where he is the International Chair of piano studies. He was given an honorary doctorate by the University of Liverpool in 2011. He became the first classical music performer to be awarded a MacArthur Fellowship in 2001, joining prominent writers and scientists who have made significant contributions in their fields. In 2009 he was named by The Economist and Intelligent Life magazines as one of 20 living polymaths. In 2010 he was named Instrumentalist of the Year at the prestigious Royal Philharmonic Society Music Awards. He is a Governor of the Royal Ballet Companies (The Royal Ballet, Birmingham Royal Ballet and the Royal Ballet School). He is a patron of the charity The Nightingale Project, which takes music and art into hospitals and of Music in Prisons (Irene Taylor Trust). He was appointed a Commander of the Order of the British Empire (CBE) in the 2014 New Year Honours for services to music. He had a solo exhibition of his paintings at the Broadbent Gallery in London in October 2012. In October 2016 Hough was the guest for BBC Radio 4’s Desert Island Discs. His choices were Cortot’s recording of Prélude No. 17 in A-flat by Chopin, Rachmaninoff’s recording of “Liebesleid” by Kreisler, “Stairway to Heaven” by Led Zeppelin, “Kyrie eleison” from the Mass in B minor by Bach, “Lyric Suite for String Quartet” (3rd movement) by Berg, Sonata for cello and piano left hand (“Les adieux”) by Stephen Hough, and “Bird Songs at Eventide” by Eric Coates. His favourite was “Proficiscere, anima Christiana (Go Forth)” from The Dream of Gerontius by Elgar. His book choice was a bilingual edition of Proust’s À la recherche du temps perdu and his luxury item was a panama hat. He made a special request for a copy of the Tyndale Bible.